It’s been almost six months since I moved into the ONS website development team. I was lucky to start the same week as the beta “customise my data” project kicked off, which meant I was able to take on a whole host of onboarding sessions aimed at bringing our friends from outside the organisation up to speed. The wise words of our Service Owner Andy Dudfield “Open the data, save the world” have really stuck with me. At the time this seemed pretty extreme for a bunch of peeps working on projects that would make our statistics more accessible. I had dabbled in Agile working before, I was aware of the principles surrounding it, but I have to admit I was sceptical of its value. I had at times thought that this was another management fad. In my career I’ve worked in many teams, each being driven by a way of working that’s more about ticking boxes than working for employees or its customers or users. In a past life as a graphic designer I was used to making calls in regards to the look and feel of a project: you take the brief from a client, you take the time to research the field, you collect what you think you knew, and you create based on those findings. On an Agile team however, it’s not one person’s perception or decision on how best to deliver to a project. Problems and solutions are discussed amongst the team, the wider team and even our users. Team members are encouraged to push back against design decisions during demos and critiques. Each discipline within the team is valued and while being considered expert in design, I’m no expert in other fields and the technical challenges they bring. It’s that invaluable insight you gain by opening up your work to feedback early that can drive better design decisions. Happy to be proven wrong is something you’ll have to get used to. Holding a design degree with almost 10 years’ industry experience means I’m more than qualified to make user interface decisions right?Wrong. The problem of delivering to a user’s perspective is that you are not the user. We can take every step to enhance usability and accessibility, but the ability to listen and react to our user findings is at the core; ultimately delivering a service that works. Every design decision is tested with our users, and each round of user research ultimately leads to iterations… and even iterations to iterations… and sometimes even iterations to… and so on. Working this way means a project driven by what we know, not what we think we know. To learn more about how we design to user needs visit this blog by Benjy Stanton “Picking things from a long list”. One of the most difficult but rewarding transitions into Agile has been embracing failure. You need to shake off the idea that this is a personal reflection of me, I can’t let people see my work when I know it’s not finished, within an Agile team we work quickly to ship to user testing a long time before the project is perfect. The learning you take onboard working in this way is invaluable. No more pixel pushing or stressing over where to place a call to action. We start with a MVP (minimal viable product) and put just enough in front of our users to give them an idea of usability. 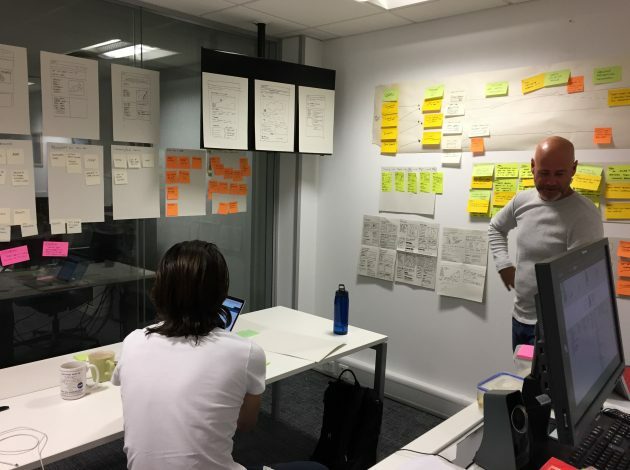 Alison Davies, our user researcher in the team, then goes out to our real users and gains an insight on how to improve on our initial assumption. This way, you save time and resources in shipping, something that the user may not even want. Above all, for me, being Agile is about embracing change and continually collaborating. Working as part of an Agile team gives me a real sense of pride and engagement with the projects that I am involved in. The passion and drive to deliver a service for our users is contagious, and what makes being part of an Agile team so rewarding. Looking back on Andy’s statement on my first day, opening data still might not save the world… but it’s something I completely buy into, and at worst we can make it a better place. Go team!